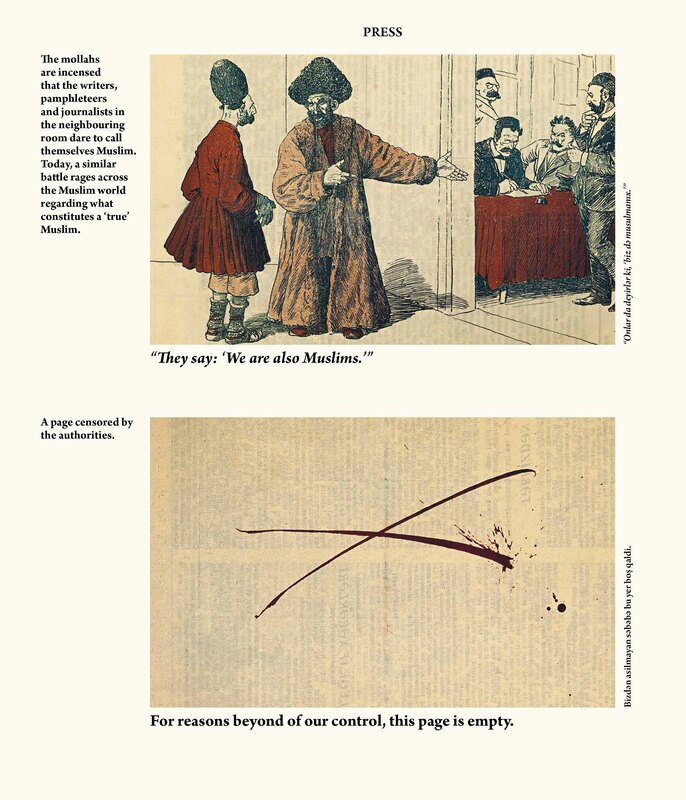 Spring 2012 edition of ArteEast Quarterly, an online publication that offers readers a critical forum for contemporary artistic practices in the Middle East, North Africa and their diaspora. Consisting of 3 sections—ArteZine, Shahadat and Gallery—ArteEast Quarterly complements ArteEast live programs to serve its global audience. The removal of work at the 2010 Sharjah Biennial was met with outrage and indignation amongst the arts community in the Middle East and beyond but often ignored the sensitive cultural context in which the work was situated. In the Spring 2012 ArteZine we approach Iran as a case study that has historically and systematically suppressed artistic expression and creative voices. But rather than simply view censorship in a negative light, the Spring 2012 ArteZine, C+ explores the productive aspects of censorship within the Iranian context. With contributions from artists, curators and scholars, this issue looks beyond censorship’s association with the foreclosure of creative expression and curtailing of audience access to art. Instead, C+ invites readers to acknowledge a value and power within censorship that reveals the transformative possibilities for art in restricted environments. Guest Edited by Sandra Skurvida, an independent curator and researcher, the issue assembles contributors who tackle censorship in a variety of ways. Interactive artist-driven projects by Sohrab Kashani, Slavs and Tatars, Katayoun Vaziri and Anahita Razmi reveal the aesthetic and generative qualities that censorship can afford practitioners. An introspective interview with Barbad Golshiri looks at the pernicious hold that censorship takes on individual movement and artists’ ability to “disturb the public opinion,” while an interview by Media Farzin with Sohrab Mahdavi explores the differences and conflicts between writers based in Tehran and those who come from abroad. Negar Mottahedeh‘s essay delineates between insurrection, religious revival, and technology to capture the “Islamic Cyborg” and Kaelen Wilson Goldie‘s treatment on risk reads as a manifesto for exceeding the market-driven censorship. For this issue of ArteZine and to learn more about the contributors click here. 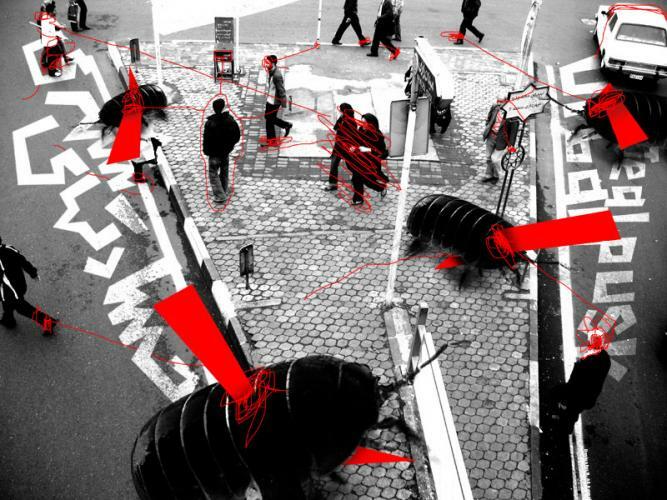 The launch of this issue of ArteZine has been marked by a public program consisting of issue contributors and followed by a response by Brian Kuan Wood (co-editor, e-flux journal) at Independent Curators International (ICI), New York on May 1, 2012 7–9pm. Click here for videocast of the panel. The figure of “censorship” conjures up a smoke screen of antagonism that can only be dispelled by looking through it. Censorship at Sharjah Biennial 2011, among many less publicized instances, gave a strong pretext for a critical investigation; it also called for a consideration in terms other than denunciation from an elevated perch of “free speech.” Rather than lament censorship as calamity that befalls art from above, why not acknowledge it as common condition in cultural production that comes to the fore in transnational contexts? In order to remain neutral, such an investigation would have to step away from a singular event and into a minefield of probabilities. The cry of “Allah-o-Akbar” was the defining sound of the 1978 protests against the Shah of Iran, during a revolution that toppled the Pahlavi monarchy and established the Islamic Republic of Iran. The Shah’s Prime Minister Major General Gholam Reza Azhari attributed, in 1978, the cry of “Allah-o-Akbar” from every street corner and rooftop, to cassette tapes. 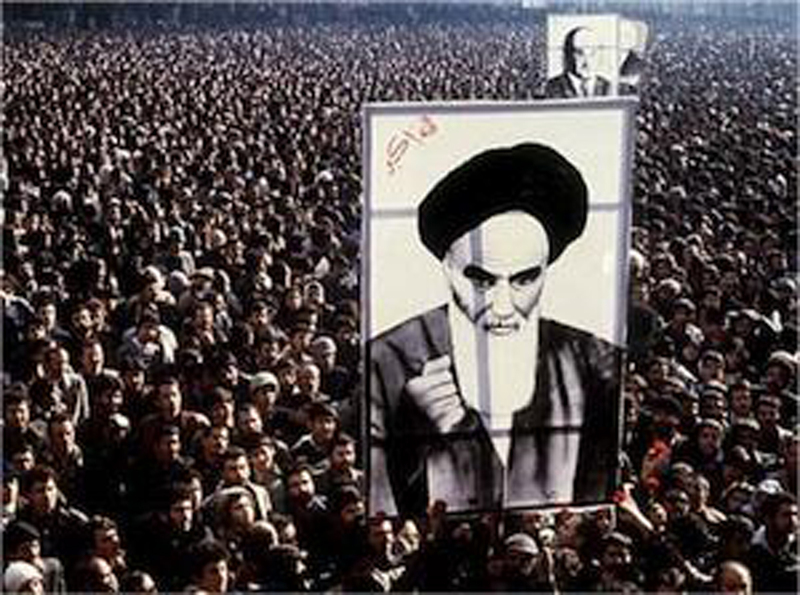 Though there is certain truth to the fact that the crowds were agitated by cassette recordings of the spiritual leader Ayatollah Khomeini’s talks in exile in the months before the revolution, the prime-minister’s unwillingness to acknowledge the growing number of dissatisfied citizens and his corollary reference to the mechanical reproduction of voices — as a placeholder for actual cries — denied in one stroke the thousands upon thousands that climbed the country’s rooftops nightly to protest the Shah and the Shah’s rapid forced Western style modernization of the nation, by calling on the greatness of God. February 7, 2012 10:18:38 AM EST SANDRA SKURVIDA: I propose a conversational shift from a stereotypical/allegorical/exilical romanticism to a political domesticism — I have in mind the younger generation of artists in Iran who exhibit in their works and their life choices an unconditional will to remain in their country, as you have declared in 2009, “We have chosen to breathe hatred, tear and pepper gas, instead of hanging onto nostalgia and the myths of exile and of “the innocent artist.” There is little “innocence” to be found in the situation where resistance is neither a romantic dream nor an academic discourse but rather everyday negotiation. This determinate domesticism calls for artworks that are socially engaged and specific to their site of emergence(y), that care for their audiences, and don’t give a damn what Europe or the US have to say about them. In 2009, you have spoken resolutely about self-definition and self-determination of an artist in Iran; how would you address this position today, two years later, in a context as saturated with intensifying political catalysis as it was then? 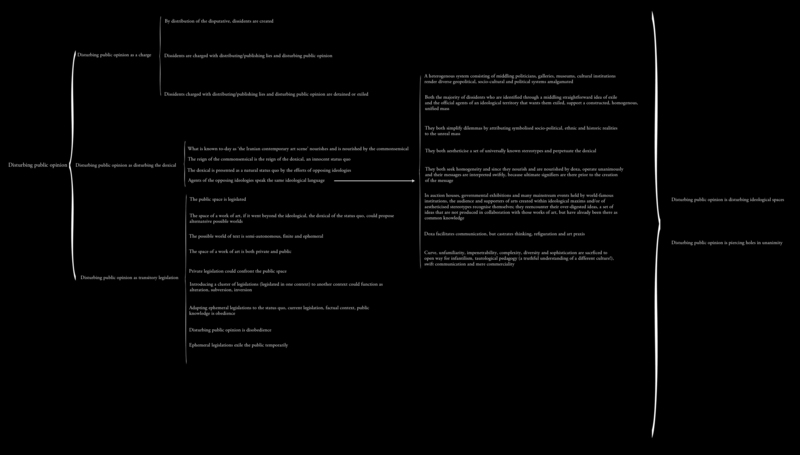 If you were to write an amendment to the e-flux essay today, what would it be? February 8, 2012 5:09:10 AM EST BARBAD GOLSHIRI: My intention was rather to topple the self that is always symbolic and is indeed determined in ideological fields. I tried to pierce holes in this “we,” an encapsulated and caricaturized symbolic mass that is usually addressed as “Arab” and/or “Middle Eastern” by both sides of exoticism. Regarding Iran, when I was writing that essay I saw a light at the end of the tunnel, but I did not see the train coming. People are again leaving the country in masses. Precious people are in prison and they are more active than us. Cities are wastelands where prisons are prospering. Yet, what the so-called Iranian contemporary art has achieved in these two years and a half is independence from the government. The only relationship between many of my colleagues and the government is censorship. And for many countries that were the case in my essay, that cluster of quasi-descriptive features is disturbed, thanks to recent uprisings in them (though it is too soon to judge the results, one can see that what they called “Arab Spring” has turned to an autumn). And the pressures in our status quo: both the Iranian government’s irrational policies and international sanctions are ruining the country. In this situation one cannot care much about our difficulties (for instance, you cannot purchase a paper bigger than one meter in length or height for drawing; and publishing houses are sinking, both because of paper crisis and by the grace of the Ministry of Culture and Islamic Guidance, an institution that bans books because of their content though they cannot understand the content). Here intellectuals are “mildews of the mind” and they will grow back anyhow. Our job is to corrupt this purity. The spreads from these pages are taken from Molla Nasreddin, a weekly political satire that ran from 1906 thru 1930, first in Tbilisi, briefly in Tabriz in northern Iran, before settling down in Baku. One of the most important periodicals of the Muslim world in the 20th century, Molla Nasreddin was a progressive weekly read from Morocco to India, thanks in large part to illustrations reminiscent of an Honoré Daumier of the Caucasus. In 2011, Slavs and Tatars edited and translated a selection of the magazine’s illustrations for the first time in English for the publication Molla Nasreddin: the magazine that would’ve, could’ve, should’ve (JRP|Ringier). As we leafed through 8 volumes, running roughly 500 pages each, recently re-issued in the original Azeri by the Azerbaijan Academy of Sciences, only the occasional page or two of Molla Nasreddin bore the mark of censors. In choosing what would make the final cut of 200+ pages, however, no poker-faced authorities advised us with the nudge of an elbow or a raised monobrow against this or that illustration.They did not have to, as we did their job for them. Image courtesy Slavs and Tatars, Molla Nasreddin: The Magazine That Would’ve, Could’ve, Should’ve (JRP|Ringier, 2011).